The Dove's Corner: “The struggle is yours as much as the accolade !”- - A post with a short poem to inspire your brilliance ! 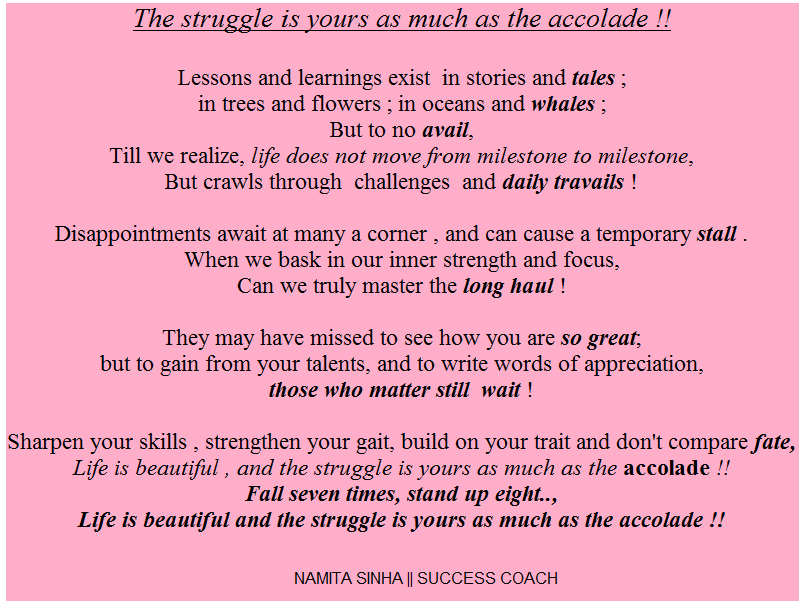 “The struggle is yours as much as the accolade !”- - A post with a short poem to inspire your brilliance ! Resilience, then, very often defined as the "ability to bounce back after encountering difficulty," is the single key factor that sets the achievers apart from the rest. Life presents hardships to everyone. What differentiates one from the other is how we respond. 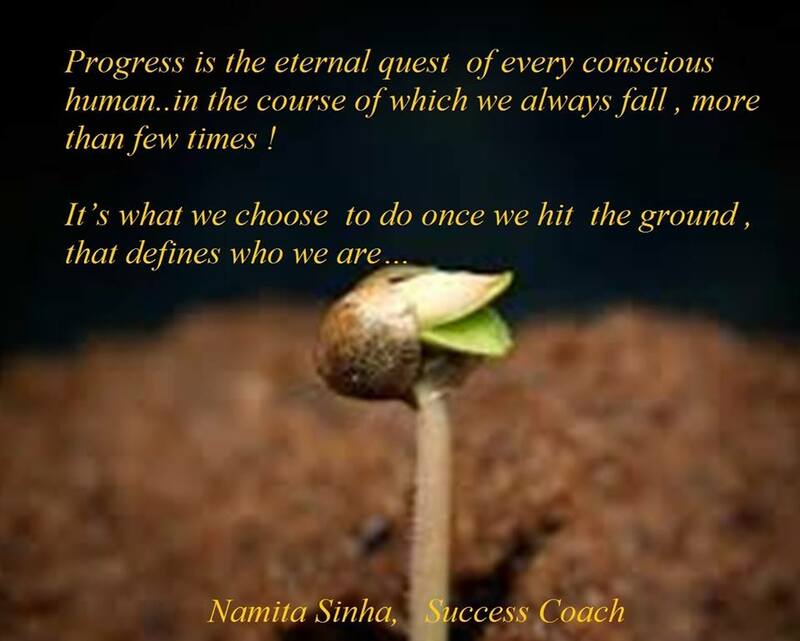 Not a single person who has made it to the top has had it rosy all the time, it has always been their ability to recover from adversities and persist on their path which has made all the difference. Some view difficult situations and setbacks as permanent and pervasive, and might then give up, while others see them as temporary and specific and as opportunities to learn and grow. Change and unexpected happenings too, are meant to occur in everyone’s life, however they have in them seeds of immense possibilities…which needs to be unraveled. How then do we pick up on this never-say-die attitude! Building on one’s self awareness , emotional intelligence , developing a growth mindset and above all knowing one’s strengths, motivations and maximizing on potentials are all crucial touch points to help build on this skill. “Know Your Why “- The bedrock is always about clarity - become clear and very precise about what you want , revisit your goals often to remind yourself where you’re going, and why ! At times of self doubt and despair, question yourself why did you come this far at the first place and what’s the point in giving up now? - If you’ve gathered images of your goal, look at them often, just to remind you what you’re aiming for . Focus on that vision and feel the energy - continually reinforce your motivation. -At the same time, become familiar - with the other side - what’s the little annoying thing or a bigger frustration that might see you throwing up your hands! Knowing your triggers, recognising the signs of when do you start feeling disappointment, and knowing exactly what fears and hold-backs may cause you to get stuck…and then overcoming them, are all steps towards helping you maintain your momentum even during tough times. areas which may have hitherto been kind of blind spots..
have been doing, and keep moving ahead - the only strategy for living our best life. Make a new beginning today brimming with optimism, start writing your dreams in full detail, and be excited about what is yet to come.. The struggle is ours as much as the accolade ! !